Okay, I know I didn't take the "before" pic, which would have been the outfit during the day. But, I realized as we headed out to dinner on my last night in Florida that this was a great example of an easy transition outfit. Meaning you can take it from day to night with just a few small changes. So, I took advantage of one of the hotel mirrors. Shoes: Steve Madden, on my WoF trip with my girlies! Holla! Okay, mentally put sandals and a big tote with this outfit, and you get what I wore all day! All I did was exchange the tote for a classy clutch and the sandals for some strappy heels and *voila* a date-worthy look! I also had on smaller silver hoops and a more demure necklace for daytime. Chunky jewelry instantly adds more of the evening-fashion-factor. So many of us girlies think we've got to have a completely different outfit to be evening-ready. Now, often that is nice, but it's not always necessary. Especially when packing for a weekend trip where you can only take one checked bag because you have to stinking pay for it. Okay. This can work with jeans and tee's. Now YOU give it a go. 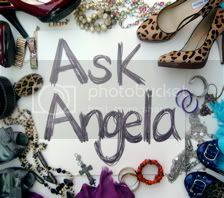 Just click that little Ask Angela button over there in the side bar and type away.